IR Infrared Thermometer is specially designed for kids to test the body temperature of a person in both ear and forehead mode. It can also test the temperature of object surface, room, food, bath water, baby milk, etc. The ear thermometer is widely used for home healthcare, medical institutes and many other occasions. Memory Function – With 32 sets of storage data to record the changes from body temperature of our babies. Infrared Measurement – Test body temperature by detecting the infrared heat from ear and forehead, also test object temperature. 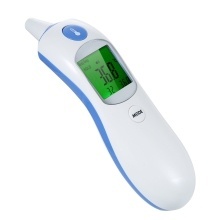 Fever Warning Function – When reach 37.6℃ & 38℃, yellow & red backlight will warn the user that he/she may have a fever. Suitable Crowd – No disturbance to sleep, suitable for baby, kids and adults. Infrared technology ensure high accuracy. Low-Power Consumption – It will be turned off automatically after about 30 seconds if there is no operation. Very Easy to Use – Unique mini ear thermometer and button design provide comfortable experience.